Will Leggett, School of Government and Society, University of Birmingham, discusses his article, ‘The politics of behaviour change: Nudge, neoliberalism and the state’ which is free to download in January 2015. In 2013 there was controversy when it emerged in the UK that unemployed jobseekers had unwittingly been used as guinea pigs for a government experiment. They had been told to complete an online psychometric questionnaire called ‘MyStrengths’, with the threat of benefit withdrawal if they did not comply. Having entered their answers, participants were presented with apparently personalised electronic messages of ‘positive reinforcement’ eg that their answers had demonstrated a ‘love of learning’. But it later transpired that no matter what answers were entered, everybody received exactly the same messages. The real objective had been to indiscriminately instil positive psychology among the participants, rather than to meaningfully engage with them. What had been exposed was a textbook, covert ‘behaviour change’ intervention. From the everyday choices of individuals (what to eat, to recycle) to the activities of errant corporations, behaviour change is a contemporary political buzzword. Of course, politics has always been about trying to shape attitudes and behaviour in some form, so what makes this agenda particularly prominent now? Three related factors stand out. The first is an increasingly complex, differentiated and individualised society, which presents challenges (eg in public health, climate change) that only widespread behaviour change on the part of both individuals and institutions can address. The second factor is political and ideological context. Thirty years of neoliberalism successfully discredited faith in direct, ‘command and control’ state action. The third factor is academic and intellectual, in the form of the rapid rise of the behavioural sciences, led by behavioural economics and psychology, which themselves operate in the advancing shadow of neuroscience. In the UK, these developments came to a head in the enthusiastic take up by the Coalition Government of Richard Thaler and Cass Sunstein’s bestselling book on ‘Nudge’ economics, and the corresponding establishment of a ‘Behavioural Insight Team’ – or ‘Nudge Unit’ – in the heart of Whitehall. The Unit has a wide-ranging brief across government, and its fingerprints were unmistakably on last year’s controversial jobseeker/positive psychology experiment. My article in Policy & Politics examines the interesting assumptions about human action that are presented by Nudge. Most notably, Nudge moves away from the discredited idea that we are fully rational, consistent calculating machines, and instead tries to capture the role of our emotions, snap decisions and fallibility in making choices in various contexts. In particular, it draws our attention to the way our behaviour can be influenced by changes to our ‘choice environment’ (eg by changing the layout of products on supermarket shelving). Nudge’s argument is that policy should go with the grain of this all too human view of humans, rather than fighting against it in the hope we will make fully rational, optimum choices. For example, our inertia makes us prone to go with default options. Rather than futilely trying to overcome human inertia per se, it can be harnessed by policymakers using the default option eg making ‘opt in’ the default with regard to organ donation. I also explore the complex and paradoxical politics of the behaviour change agenda. Thaler and Sunstein presented their project as a new ‘libertarian paternalism’. It is paternalistic, because nudgers are attempting to promote the best interests of ‘nudgees’ (e.g. to lose weight). But it is also libertarian in the sense that there is no compulsion, and the individual always ultimately has the option to choose differently/opt-out if they wish. Unsurprisingly, having set itself up as a new libertarian-paternalism, criticisms of Nudging have poured in from both these of these traditions. Paternalists (typically on the statist left) see in Nudge the ideological retreat of state action and responsibility for public goods. Conversely, libertarians (from both left and right) see Nudge as a sinister state incursion into our very brains and decision-making. This ambiguity is reflected in the party political take up of Nudge. Behavioural economic ideas were first encouraged in the UK by New Labour, and might be seen as a classic instance of the ‘nanny statism’ they were often accused of. And yet the behaviour change agenda has been even more enthusiastically co-opted by David Cameron and his anti-statist inner circle. Beyond these familiar dichotomies, more thought needs to be given to the ways that behaviour change is recasting the state-citizen relation, and what alternative forms the behaviour change state might take. A ‘Nudging state’ risks depoliticising and diminishing our faith in positive state action. In the Nudging model, the state is just another voice trying to grab consumer attention in an already crowded market: it becomes no different to the private sector marketers and advertisers who have been subtly shaping our preferences for many decades. An alternative, social democratic approach could use the behaviour change agenda to reassert the importance of an active state, but in a way that develops more empowering models of citizen engagement than traditional command-and-control approaches. The important insights of behavioural theories should be heeded, but the traditional case for state regulation, mandates and bans needs to be sustained: it is increasingly clear some behaviour change will require a ‘shove’ rather than a nudge (eg smoking in public places). Simultaneously, the case needs to be made that the state is the only institution that can protect citizens against potentially undesirable or damaging attempts to shape their behaviour. This might take the form of direct regulation (eg curbing advertising aimed at children). More creatively, it could involve raising awareness of ubiquitous attempts to shape decision-making, and equipping citizens with the psychological and deliberative toolkit to define and implement – individually and collectively – their own behaviour change agenda. This would necessarily be linked to broader questions about the good society, rather than just immediate ‘choice environments’. So what emerges is a more complex vision of the modern social democratic state, in an age where behaviour change is an integral objective. Crucially, this recognises that behaviour change is not politically neutral, as some of Nudge’s advocates like to suggest. Instead, it raises fundamental questions about the citizen’s relationship to the state and the market, about which social democrats and neoliberals will have very different things to say. 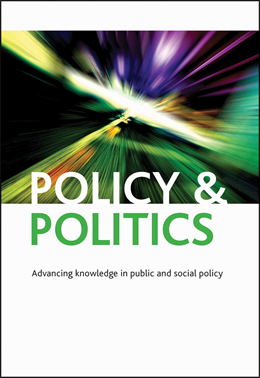 ‘The politics of behaviour change: Nudge, neoliberalism and the state’ is part of the Policy & Politics January 14 issue (volume 42, number 1) and is available for free in January 2015.